What is fear? It's just a word. You take the "f" out of it and all you are left with is "ear." And that means absolutely nothing. 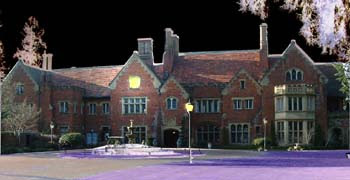 Thornewood Castle is haunted. It's a fact. I read it on the Web. Chester Thorne and his wife Anna (and potentially their son-in-law) have never left the castle they called home. 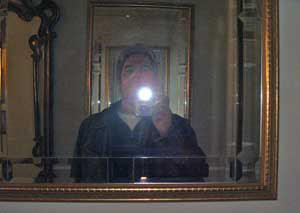 I knew this going in yet I have always been compelled to meet a ghost...or a celebrity...or a celebrity ghost. So as we stepped out of the car and walked toward the massive wooden doors of Thornewood Castle I felt a certain sense of uneasiness mixed with excitement. And just as we were about to knock on the door (with very impressive knockers I might add) it creaked open. "You can't park there, you need to move your car to that open space over there," the housekeeper/cook/desk clerk told us sternly, pointing toward the horizon. I looked at Tess and she looked at me and we knew that our adventure with the supernatural was about to begin (just as soon as we moved the car). After moving the car we walked back to the castle and stepped through the doors. The first thing we saw was a massive stairway winding its way up to...well, we could only assume the second and third floors. I snapped my first photo (any experienced paranormal investigator knows that the only real way to see spirits is to randomly snap photos and capture them with their astral pants down). There. Can you see it? 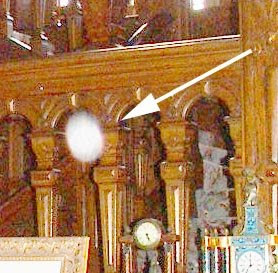 Right out of the chute I captured my first spirit photo -- a distinct orb if I ever saw one. I believe this is Chester, but I can't be absolutely certain. Take a closer look. Yes, another orb. I believe this one is Chester's wife, Anna. At this point, both Tess and I were giddy with anticipation. We climbed the stairs to the second floor and put our bag in the Blue Room and quickly ventured out to explore. We gasped as we entered a small room obviously trying to give us a sign of some kind.. I'm not sure what the owners were trying to tell us, but we quickly crossed the hall to the library and made a startling discovery. 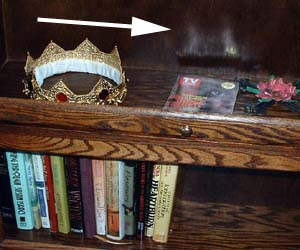 There in a bookcase containing oddly enough a crown was another orb, hovering over a TV Guide promoting Stephen King's mini-series Red Rose, the exact same mini-series that had been shot in...Thornewood Castle. We backed out of the library and walked down the hallway. And for some reason I kept thinking someone was watching us. Despite my fear I kept snapping photos. And then I snapped the most horrifying photo of all. 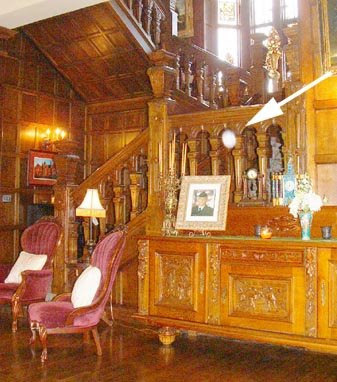 The orb is distinct, massive and obviously supernatural. After brightening it up in Photoshop, I make an even more startling discovery. 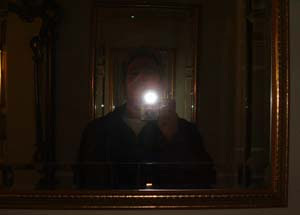 This is the first orb photo I have ever taken that obviously shows the spirit taking on its more corporal, human shape. It's hideous yet compelling at the same time. We returned to the Blue Room to face the long night ahead. That's when we found even more evidence of a force in the castle that was trying to tell us something. All of the pillows that had been piled on the bed were now on the loveseat in the room. Who or what had done this? Why? And why so many pillows? Ice water flowed through my veins (along with some pretty decent red wine) as we crawled into bed to face the long night ahead. As Tess slipped off to sleep, I could hear her gentle snoring as I lie awake listening and wondering. I couldn't help thinking about the movie Sixth Sense and the scene where the little boy gets up to go to the bathroom and the hideously disfigured ghost scuttles past the doorway while he relieves himself (obviously dead people have no sense of decorum). So I lay there holding it in, praying for the morning light because I no longer wanted to see any dead people and I really had to go. 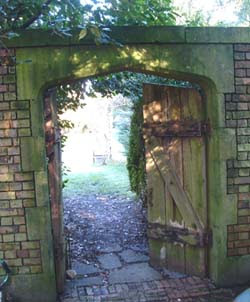 Tomorrow I continue my strange and fantastic journey into the unknown and take you on a tour of Thornewood Castle's secret garden where the fairies are supposed to dwell. so tell me Tim Elvis.. were there any burned out light bulbs??? morningstar - of course who else.. I love tagging along on your ghost story. Quite compelling evidence of the afterlife here Tim. Those pillows reminded me of this time I freaked the hell out of my mother. I know how to break into homes you see... and this one time I came to visit her, and she was gone. So, I broke into her house to leave her a note. Instead, I arranged her couch pillows in a stonehenge pattern. I got a hysterical call from her later that evening. She thought the devil was after her. Boy... ghosts are sure fun to play with aren't they? 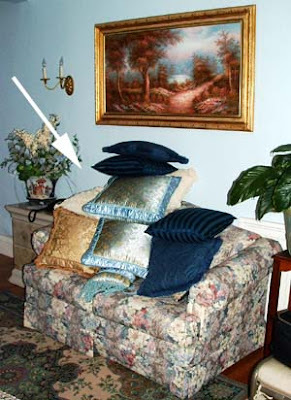 Those pillows were so delicately and artistically balanced that only an intelligent agent could be responsible! It was obviously the work of an interior designer! Your photographic evidence has made a true believer out of me. I will never doubt the power of photoshop again! Thanks Shandi, I learned everything I know about psychic investigations from Most Haunted on the Travel channel. Actually I think my evidence is more plausible than theirs. I'm hurt, the Michael. The only Photoshop tricks here were the arrows used for illustrative purposes. Oh, and I might have enhanced the animated painting a tad. But that was literary license added to give the reader a sense of how it felt to have these paintings staring at you. And the first castle shot was actually shot in daylight. But the orbs were in the original files. And maybe, just maybe, Tess might have moved the pillows onto the love seat. But there were a ton of them. lmao @ morningstar's post! Too Funny. But, wow... i really must say that i'm very much impressed with the design and architecture of that place inside and out. I would not want to be the one to have to polish all that wood. 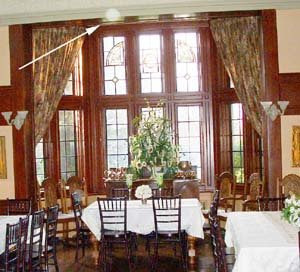 And the spirit orbs... omg, so cool! You got some incredible shots. And your skills with Photoshop on the portrait one.... Love it! Awesome job Tim. I know how time consuming it can be to create that effect and you did a fantastic job. You really are the "King" aren't Ya? ;o) Great Post. Keepem coming. Thanks Gina, but please don't encourage Morningstar. :) Thornewood Castle was indeed a beautiful place. The owner told us that when it was first built they had 60 servants to maintain the house and grounds. Now three people are employed full time to help. That's a lot of wood to polish is right! Awesome post!! I really loved the pictures. That castle look so very awesome! I am off to google it. 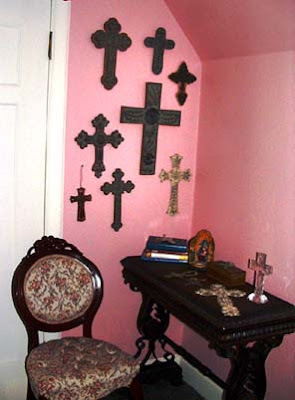 What's up with that room full of crosses? That was the wierdest part. That wasn't there when we, I mean, they shot that Stephen King movie there. Thanks Cherish, wait until you see the garden photos! Lights, you know exactly what the crosses were there for. And that crown was so obvious. But just for the record my friend, there is a new King of the castle. Capice? TIM!!! what do you mean .. "don't encourage morningstar"????? Okay..the "orb" over the tv guide... IS THE TV GUIDE!!... look closer!!!!... you should really pay attention to these things before you post them for all to see... you can see CLEARLY the yellow sticker on the TV guide IN the reflection!!! You are too quick for me. But who is to say that TV Guides don't have spirits or that a spirit wasn't reading the TV Guide. So judge not lest ye be judged.